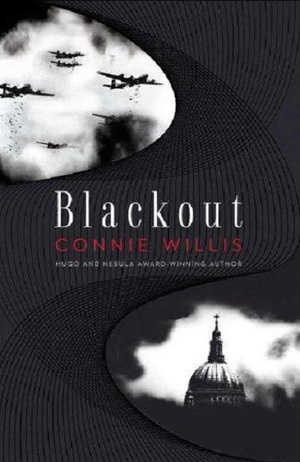 I just finished reading All Clear and Blackout, a two-volume novel from Connie Willis’s Oxford Time Travel series. I also read Firewatch and The Doomsday Book, which are earlier stories in the series. 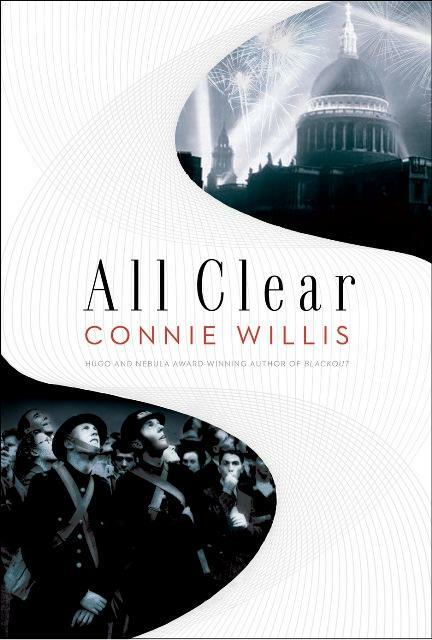 All Clear and Blackout are about three time traveling historians from the future who get stuck in England during World War II. The writing is brilliant, the historical information in the books really teach you and make you want to learn more about World War II, and you feel completely engrossed in the story. I found myself looking up information on the Internet, watching WWII movies, and checking out WWII books from the library. I found WWII timelines and Eyewitness books to be especially helpful. Today, I’ve been knitting and quilting, in preparation for a special baby shower I’m attending on Saturday. I don’t want to say more, as the mommy-to-be is possibly reading this post. Let’s just say she can attempt to get some specifics out of her mom, who knows all. I’ve still got loads of homework to do, but I am really enjoying being on vacation. I’m reading Bride in the Bargain, by Deeanne Gist, and I just can’t put it down. 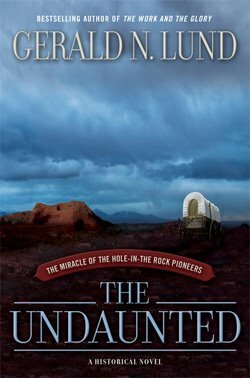 I just finished reading The Undaunted. 800 pages. Well worth it. In fact, I couldn’t put the book down. I had so many plans for the weekend. They all got pushed aside as I delved into this fabulous book. It starts with a 6-year-old boy working in coal mines in England. It follows him as he emigrates to Utah as a teenager. When he is in his early 20s, he begins a challenging pioneer journey in southern Utah. In the late 1870s, a group of missionaries/pioneers set out to find a shorter route from Escalante, Utah to the southeastern corner of Utah, near what is now Bluff, Utah. These families set out on what they thought would be a 6 week trek. It took 6 months, because they had to build wagon roads through challenging terrain. It’s a fabulous book filled with historical facts and people (woven into the story with the fictional characters), faith, perseverance, and love. I finally finished reading Breaking Dawn by Stephenie Meyer. It took me a few days. When I needed a break (too much suspense), I would sew. I now have a lovely new dress and two ankle length skirts. Fun! I must say that Breaking Dawn was simply fantastic. I’ll probably read it again, if I don’t re-read the entire series. When I first saw the trailer for the Twilight movie, I thought it was just some random, scary, teen movie. When I was at a small town Wal-Mart that had several copies of the Twilight books and not much else, I began to wonder at it’s popularity. After I began reading the first book, Twilight, and absolutely couldn’t put it down, I finally understood. Stephenie Meyer has written a captivating romantic series about Bella, a human girl, who falls in love with a vampire named Edward in the first book, Twilight. In the second book, New Moon, things become more complicated as Bella becomes best friends with a werewolf (an enemy of vampires) named Jacob. The third book, Eclipse, brings the vampires and werewolves together in an effort to protect Bella from Victoria, a hunting vampire. Meyer goes into great detail with feelings, action, and back stories. You get to know the histories of each of the main characters, such as how Edward became a vampire. For those of you who are wondering, yes, the books are very romantic, but the characters never go too far. Edward is a stickler for marriage first. All that I can say is that I lost sleep reading these books, because I couldn’t put them down. I can’t wait for the movie to come out in December, and I don’t know how I’ll stand it waiting for the library to get the fourth book, Breaking Dawn, in August. I would like to share a favorite book of mine with you. 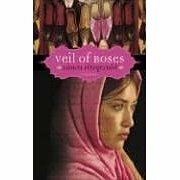 Veil of Roses by Laura Fitzgerald is a lovely novel. It focuses on Tamila, a young woman who grew up in Iran. She travels to America to stay with her sister. The goal: find a Persian-American (Iran-American) husband via an arranged marriage, before her Visa runs out. As Tamila is introduced to a variety of Iran-American suitors in the evenings, she spends her days attending ESL classes at a local university. There, she forms friendships that will further shape her outlook on life. I loved reading about Tamila’s experiences of so many things that I, as an American woman, never think about. Tamila finds joy at seeing young girls swinging on a swing-set on a public playground. That would never have been allowed where she grew up. I especially enjoyed the “secret” friendship Tamila begins with Ike, a young American man who works at a coffee shop. As they chat outside the cafe or he accompanies her to her sister’s house after ESL class. Tamila begins to fall in love with him. The struggle is that she is supposed to agree to an arranged marriage with a Persian-American man, yet she has trouble finding one that she would be happy with. This was a very romantic story, yet “pure” story. I absolutely adored the ending. I keep going back to re-read this book again and again, just because of how it makes the rest of Tamila’s experiences worth it. In addition, I enjoyed learning about Tamila’s culture as she constantly adapted to differences in America.